This is the first post of the new Islamic year but unfortunately there is not much to celebrate for the muslims all round the world. Israel's attacks on Gaza are now being talked about all over the world. 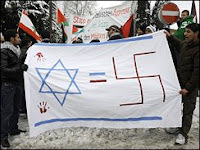 It is being termed as Israel's holocaust. The situation is getting worse day by day and on last count 700 Palestininans have been murdered and thousands have been injured by Israel's heinous attacks. 2) Hezbollah is a major wing the West Bank and not in the Gaza Strip. Hamas is responsible for Gaza, so why are the attacks being targetted at Gaza? It is indeed a sorry sight to see the innocent Palestinians being killed. Schools have been targetted by Israel, women have been killed but there is no one to stop the Israeli tanks and missiles. America is making some half hearted efforts due to which a 3-hour window has been initiated during which Israel would not attack Gaza and medical help would be provided to Palestinians. A truce is needed at this moment. But as we have seen in the past, no sanctions will be imposed on Israel by either UN or the USA. The role of UN is almost of an American toy, and that is sad to see.